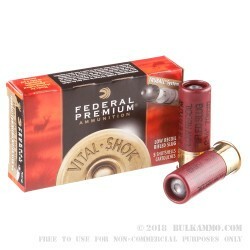 Federal Premium’s Vital-Shok True Ball low-recoil rifle slugs deliver one of the most consistent, smooth bore shotgun slugs available today. Through their innovative True Ball system, these shells close the gap between rifled and smooth bore ammunition. Federal places a plastic ball between the wad and slug, keeping all the components together until they exit the barrel. This allows for a more accurate shotgun slug, capable of groupings no larger than 1.4 inches at 50 yds during testing. 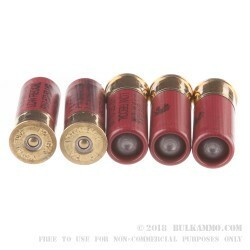 These 12-gauge shells feature 1 oz. 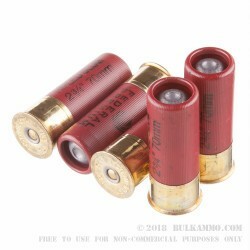 slugs, loaded into 2 ¾” shotgun shells and are capable of a muzzle velocity of 1300 FPS. These shells also feature a low-recoil load, for less felt recoil and higher accuracy because of lower shot anticipation. An industry leader, Federal produces some of the most popular ammunition made today. Based out of Anoka, Minnesota, Federal manufactures ammunition for a wide variety of uses and is known for their Power-Shok, Vital-Shok and HST lines. 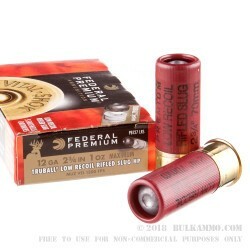 This bulk package of 12-gauge Federal ammunition includes 250 rounds.